Put chicken and Mexican spice in a clean plastic bag or large container with lid and shake to coat the meat with the spices. Heat oil in a large heavy-based frypan on medium heat. Cook chicken in batches for 5-8 minutes per batch, or until chicken is cooked and golden. 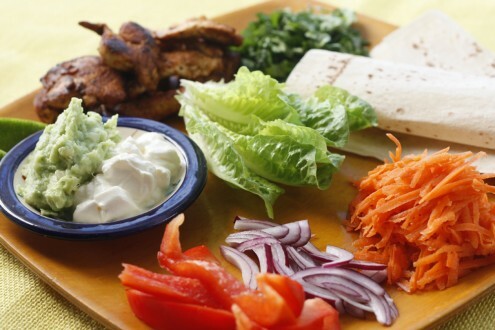 Arrange all the prepared ingredients on a large platter or in individual bowls and let people assemble their own burritos. Reminder: Don’t forget to take into account the carbohydrate in the carrot as well as in your serving of bread. Variation: Use fish, beef or lamb instead of chicken. I’ll hopefully feature some more Mexican recipes in the near future. I agree. Very delicious, simple & colourful food. One of my favourites.